The Transportation Equity Act for the 21st Century, or TEA-21, enacted in 1998, following the Intermodal SurfaceTransportation Equity Act (ISTEA) of 1991, defines the “public” as “citizens, affected public agencies, representatives of transportation agency employees, freight shippers, private providers of transportation, representatives of users of public transit, providers of freight transportation services and other interested parties.” More recently the Federal Highway Administration (FHWA) has expanded this definition to include underrepresented groups “such as low income or minority households and the elderly”. 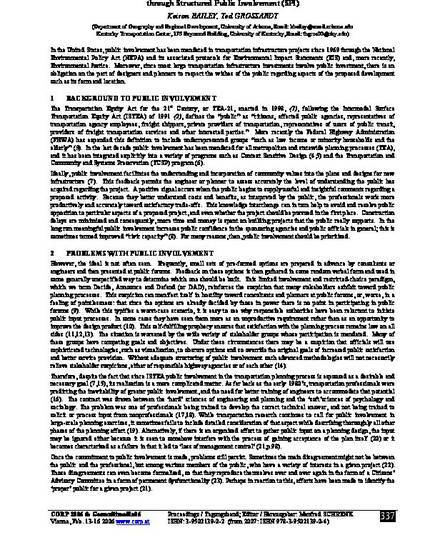 In the last decade public involvement has been mandated for all metropolitan and statewide planning processes (TEA), and it has been integrated explicitly into a variety of programs such as Context Sensitive Design and the Transportation and Community and Systems Preservation (TCSP) program. Ideally, public involvement facilitates the understanding and incorporation of community values into the plans and designs for new infrastructure. This feedback permits the engineer or planner to assess accurately the level of understanding the public has acquired regarding the project. A positive signal occurs when the public begins to supply useful and insightful comments regar ding a proposed activity. Because they better understand costs and benefits, as interpreted by the public, the professionals work more productively and accurately toward satisfactory trade-offs. This knowledge interchange can in turn help to avoid and resolve public opposition to particular aspects of a proposed project, and even whether the project should be pursued in the first place. Construction delays are minimized and consequently, more time and money is spent on building projects that the public really supports. In the long run meaningful public involvement increases public confidence in the sponsoring agencies and public officials in general; this is sometimes termed improved “civic capacity”. For many reasons, then, public involvement should be prioritized. Published in Proceedings of the 11th International GeoMultimedia Symposium CORP2006, p. 337-341.